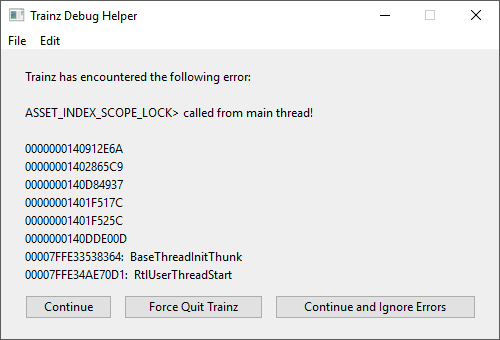 We're now working on the next free update for Trainz A New Era - Service Pack 3 "Hotfix 1", as well as our next Trainz Railroad Simulator 2019 "Early Access" update. This means it's time to expand our testing and this time we're trying something a little different. We're offering all existing owners of each or our current Trainz products to become involved in the "Open Beta" testing. The process is simple - make a copy of your existing build as a backup, and then follow the instructions below. Should I Become a Beta Tester? We have come a long way since the early TANE beta testing, but we also know that there are still a number of issues that are not yet resolved. If you are NOT interested in finding and reporting any bugs that you find (and you WILL find some bugs), then we suggest you wait until the official release. If you are keen to take a look at progress as we work towards the next official release, then we'd love to have you on board and help us identify issues with your content set etc. Create a backup copy of your install folder and your local data folder (Click Trainz Settings > Install to find the path to your local data folder). Any work done in the Beta version MAY need to be deleted. Select 'TRS19 Beta' or 'TANE SP3 Beta' depending on which build you are updating of course. If you get a connection error, click Retry and the process will pick up where it left off. Once updated, the 'Engine Start-up' process will kick off, then you are ready to begin testing and submitting bugs that you find. For these beta releases we still have "Assertions" enabled. So, what is an assertion? Here is an example of a message that you may see when using this beta version. These messages are not ERRORS, but rather message indicators to provide information to our programmers about code that is running at that time. It and may or may not result in something being broken. If you see an assertion message, simply take a screenshot using windows PrintScreen of an external image capture tool, click Continue and submit a bug report. Thanks for your support and happy beta testing.